This article is about the ship Mario pilots in Super Mario Odyssey. For the game itself, see Super Mario Odyssey. The Odyssey is Mario's airship and main method of transport in the game Super Mario Odyssey. It resembles a short red top hat with golden propellers that protrude from the bottom of the ship when starting up on the outside and on the inside it has a white and gold color scheme with three windows, some chairs and a table, a pair of shelves at the back, a small hat-shaped wardrobe and a mirror. The exterior is also decorated with a globe, a Checkpoint Flag and a tall red flag at the back. The door that leads to the Odyssey requires Mario to throw Cappy at it to open; the player can also enter the interior using the exhaust pipe like a Warp Pipe, or by Ground Pounding the panel on top of the ship. Throwing Cappy on the globe adds the current amount of Power Moons in Mario's possession to the ship and it allows Mario to select another kingdom to travel to afterwards. While flying between kingdoms, before the player completes the game, Cappy provides an overview for one of Mario's skills that can also be accessed at any given time in the Action Guide. The Odyssey flying over the clouds. During the events of the game, Mario and Cappy use the Odyssey to fly across the various kingdoms throughout the game to chase down Bowser and stop him from forcibly marrying Princess Peach. After Cappy reveals that a "fairly functioning ship" based on an older model of the Bonneton airships is believed to be in the Cascade Kingdom, the two head to said kingdom, where they find a broken-down airship that originated from the Cap Kingdom which they restore using Power Moons. 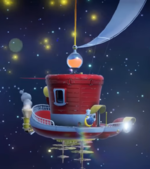 The ship requires Power Moons and Multi Moons to work, as they act as a source of fuel for the Odyssey, similar to how the Comet Observatory and the Starship Mario used Power Stars as fuel in Super Mario Galaxy and Super Mario Galaxy 2, respectively. The souvenirs that can be bought for decorating the Odyssey, both on the inside and the outside. In each kingdom Mario must collect a certain number of Power Moons to upgrade the Odyssey, expanding its sail and allowing him and Cappy to reach the next kingdom. On two occasions, though, Bowser destroys the Odyssey and it requires the given amount of Power Moons to be activated again; thus, traveling is not always possible. The first time the ship takes heavy damage is after defeating Bowser during the battle in Cloud Kingdom; the ship crashes in the Lost Kingdom and requires 10 Power Moons to be repaired. Later, on the way to Bowser's Kingdom, Mario and Cappy are interrupted by Bowser and the Ruined Dragon, who consequently destroys the ship. The Odyssey then needs 3 Power Moons from the Ruined Kingdom to be repaired. Eventually, the sail expands enough to close in on itself, turning the Odyssey's sail into a balloon and granting it the ability to fly to the Moon Kingdom, where Bowser plans to hold his wedding. The height of the sail/balloon is determined by Mario's overall Moon total across all Kingdoms. For every kingdom Mario collects all the Power Moons and Multi-Moons from and brings to the Odyssey, including those from Moon Rocks and Toadette's Achievements, a small circular light appears on a cardinal point beneath the Odyssey's globe in the same color as that kingdom's Power Moons, excluding those from Dark Side and Darker Side, whose lights are positioned inside the circle of lights, closest to the globe. Should the player collect all 880 Power Moons (not including extras brought from Crazy Cap), the sail turns gold. 999 is the numerical limit the Odyssey displays on its balloon and on the save files. Any moons bought afterwards won't add to the number. Mario can also decorate both the inside and the outside of the Odyssey with stickers and statues purchased from local Crazy Cap shops in each kingdom. These stickers and statues are based upon the kingdom in which they were purchased and function as souvenirs; for example, a sticker of Mayor Pauline from the Metro Kingdom, or a statuette of the Inverted Pyramid from the Sand Kingdom. The Odyssey's wardrobe can be used to change Mario's outfit at any time. Mario also recovers any health lost when inside the Odyssey. The Odyssey's cameo in Captain Toad: Treasure Tracker. The Odyssey makes a short appearance at the end of the Nintendo 3DS and Nintendo Switch versions of Captain Toad: Treasure Tracker. After landing in the Sand Kingdom with the mine cart, Captain Toad notices the ship flying across the sky at night time and gives it chase, leaving Toadette inside the mine cart. The Odyssey seen flying in Super Smash Bros. Ultimate. In Super Smash Bros. Ultimate, the Odyssey can occasionally be seen flying around in the background of the top of the New Donk City Hall stage. The Odyssey also appears as an advanced support spirit that grants the effect of strong-wind resistance to the user. The sketch of the early desing of Tostarena included an early design of the Odyssey as well, showing various small differences with respect to the final design. The sail was attached to the back of the crown of the hat, without any visible vial collecting the Power Moons, said sail was also attached to the back parapets through a rope attached to a moon-shaped hook. The back of the brim was flat and rather had an higher parapet. No globe was visible on the right side of the ship and the window had the shape of a hat with a flat brim. The exhaust pipes also apparently pointed backwards rather than upwards. The final design was based on ships and top hats, and it was mainly colored red and white to reference Mario and Cappy, respectively. Furthermore, the shape of the hat was hidden in various parts of the Odyssey's final design. Its interior was based on that of a ship and an airplane to recall the concept of traveling, while the furniture was based on hats. Concept art of an earlier design of the Odyssey. Sketch of the final design of the Odyssey. Sketch of the final design of the interior. The Odyssey in the Metro Kingdom. Mario on the Odyssey in the Sand Kingdom. Bowser and the Ruined Dragon confronting the Odyssey. The Odyssey in the Mushroom Kingdom. Power Moons around the Odyssey. The interior of the Odyssey. A "Super Mario's Relaxing Life" LINE sticker showing Mario flying away on the Odyssey. When Mario jumps on the globe of the Odyssey, a music-box version of either Jump Up, Super Star! or the Fossil Falls theme will play, depending on the kingdom the ship is currently at. The lamp attached to the Odyssey occasionally blinks, making it look like the Odyssey itself is alive. The intervals it does so alternate between roughly 12 seconds and 18 seconds. The tune that plays when restoring the Odyssey is a slight variation of the tune that plays when Mario grabs a new item in Super Mario Galaxy. Inside the Odyssey, if Mario sits on one of the two chairs, Cappy will come out from Mario's current hat and look at different collectables inside the Odyssey. After looking he will give a wink to the player, or look left to right as if he was confused. Also, Mario may doze off onto the couch shortly after standing atop of it. ↑ 1.0 1.1 1.2 Post about the concept art of the Odyssey's final design from the Japanese Super Mario Odyssey official Twitter account. Retrieved January 12, 2018. ↑ Post about the concept art of the final design of the Odyssey's interior from the Japanese Super Mario Odyssey official Twitter account. Retrieved May 3, 2018. This page was last edited on April 14, 2019, at 19:56.